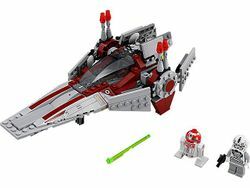 75039 V-Wing Starfighter is a Star Wars set released in 2014. This is a description taken from LEGO.com. Please do not modify it. (visit this item's product page) Launch a daring rescue with the agile V-Wing Starfighter™! Jump in the V-Wing Starfighter™ with opening cockpit, rotating wings for flying and landing modes, new dual spring-loaded shooters and Astromech Droid™. Then speed off to planet Mustafar and help return the injured Anakin Skywalker™ to the dark forces of the Sith. 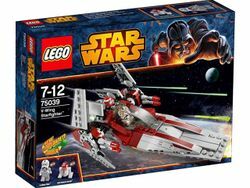 Includes a V-Wing Pilot™ with blaster pistol and an Astromech Droid. Facts about "75039 V-Wing Starfighter"
Launch a daring rescue with the agile V-Wing Starfighter™!